White-tailed Eagles have successfully hatched chicks across four counties in Ireland. Eight pairs of White-tailed Eagles have nested and laid eggs with five nests successfully hatching chicks in counties Clare, Cork, Galway and Kerry. In the last few weeks’ chicks hatched in nests on Lough Derg at Mountshannon, Co. Clare, at Glengarriff in West Cork, and in Killarney National Park, Co. Kerry. Pairs also successfully hatched chicks at a nest in Co. Galway for the first time and at another site in Kerry. Three other pairs nesting in Kerry failed to hatch successfully. Interestingly two of these “pairs” were made up of trios: two males and a single female at one site and two females and a male at another, both in Kerry! The first nest to hatch young in 2015 was at Glengarriff, Co. Cork, in mid-April with fledging (its first flight) expected in early July (11-12 weeks old). Later in April a pair was confirmed to have hatched chicks at their usual nest site on Lough Derg, near Mountshannon, Co Clare. This pair created history in 2013 when they reared the first chicks to fly from a nest in Ireland in over 100 years. The pair also reared the only chick to successfully fledge from a nest in 2014. The pair resident on the Lakes of Killarney in Killarney National Park hatched a chick in early May. Encouragingly two other pairs, one in Galway and another in Kerry both hatched chicks for the first time. Hopes are high that the five successful pairs will successfully raise chicks that will go on to form the basis of a viable population in Ireland. This would potentially be the first White-tailed Eagle chicks to fledge successfully in Kerry, Cork and Galway, Clare already having been successful in 2013 and 2014. These are the latest chicks of the high profile reintroduction programme which began in 2007 with the release of 100 young Norwegian eagles in Killarney National Park as part of the White-tailed Eagle Reintroduction Programme managed by the Golden Eagle Trust in partnership with the National Parks & Wildlife Service. Vera O’Rourke spoke on behalf of the Mountshannon Eagle Group “We are really pleased that the eagle pair “Caimin and Saoirse” has successfully hatched again this year on an Island close to Mountshannon for the third year in a row. It’s great news for the whole of the Lough Derg area. We thank everyone for their cooperation in helping to protect these birds and their nesting area. We ask that people keep their distance from the nesting Island to give these magnificent birds of prey every chance to rare their chicks. Remember you don’t have to go out on the lake to view the eagles. A specially constructed Bird Viewing and Information Point (BVIP) supplied by the Clare County Council is opened at Mountshannon Harbour from where people can view the eagles through telescopes that are in place within the unit. The BVIP is opened and run daily by Information Assistants from whom visitors will get up to the minute information on the activities of the Eagles”. The news of hatching eagles has also been greeted with delight in West Cork. Local Conservation Ranger Clare Heardman has been watching the pair’s progress closely since nesting began. “It has been an incredible experience watching the eagles in Glengarriff working towards what will hopefully be their first breeding success, having lost a chick at two weeks old in 2014 due to bad weather. After sitting tight on the eggs for over a month, the parents again faced the challenge of keep the chick warm, dry and fed as the weather turned particularly bad at the beginning of May. However, they demonstrated their greater level of experience as parents and the chick survived the storm. The nestling is looking big and strong now at over six weeks of age, and it is very exciting to think that 2015 could be the first year in over a century that a Cork-born white tailed eagle is seen flying again”. Local NPWS staff would like to commend the role of local people, in particular the ferry operators in Glengarriff Harbour, for helping ensure the eagles were not disturbed by people out on the water. We would urge anyone interested in seeing the eagles to observe them from a distance. The news of nesting White-tailed Eagles has generated alot of excitement locally in East Clare, West Cork, as well as Galway and Kerry and is likely to attract the attention of people keen to see the birds. However disturbance, particularly during the early stages of nesting when the birds are on eggs or have small chicks, would be detrimental to the pair’s success. “We are very conscious of the risk of disturbing the birds especially at this stage of nesting”Dr. Mee added. Please note that it is an offence under the Wildlife Act (1976) to willfully disturb White-tailed Eagles at the nest. Disturbance could result in the birds leaving the small chicks unguarded for a period during which they could be predated or be chilled or the birds could desert the site. We would caution people not to approach the nest area but instead avail of the unique opportunity to watch from a nesting pair of sea eagles from nearby Mountshannon pier. Information on the birds, their ecology and conservation will be available. We would like to acknowledge the goodwill and assistance of local people in the Mountshannon area, Mountshannon Community Council, local angling, gun clubs and Clare County Council before and during the nesting period“. ·         The White-tailed Eagle, Golden Eagle, and Red Kite Reintroduction Projects in the Republic of Ireland are managed by the Golden Eagle Trust in partnership with the National Parks & Wildlife Service of the Department of Arts, Heritage and the Gaeltacht in the Republic of Ireland. ·         White-tailed Eagle chicks were collected under licence in Norway and transported to Ireland for release. ·         One hundred young White-tailed Eagles were released between 2007 and 2011 in Killarney National Park, Co. Kerry. To date 29 birds have been recovered dead, mainly due to illegal poisoning. The breeding population of White-tailed Eagles has increased from one pair in 2011 to 14 territorial pairs in 2014. The first nesting in the wild was near Mountshannon, Co. Clare in 2012 and the first chicks also fledged (flew) from a nest near Mountshannon in 2013. The young eagle (named Aoibheall) fledged from the nest in Mountshannon in July 2014 spent its first winter on Lough Derg and later on the Little Brosna callows in south Offaly before moving up the Shannon to Lough Ree. Illegal poisoning remains the greatest threat to the eagle’s recovery. A six-year old breeding female was found poisoned on the nest near Roundstone, Co. Galway, in April 2015. Her mate has since deserted the nest site. Nesting White-tailed Eagles feed predominantly on fish and to a lesser extent on birds and small mammals. Some 10,000 people visited Mountshannon, Co. Clare, in summer 2014 to view the breeding White-tailed Eagles. A visitor survey found that White-tailed Eagles were the primary reason for visiting Mountshannon for 43% of those surveyed. Most (55%) stayed in the local area on visits. Most (89%) also said they would come back to see the birds in future. The hen harrier is protected by the EU Birds Directive and listed on Annex 1 and as such monitoring, research and protected areas are a vital component for the conservation of the species. In addition, survey and monitoring data collected during national surveys are vitally important as these data are used by the government and other agencies to help inform management and conservation decisions. Several declines were recorded during the last survey in 2010 and it is important that we re-survey to establish the status of the species in Ireland. 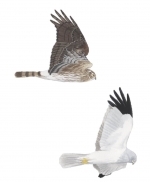 Similar to previous years the survey will cover all suitable hen harrier habitats within 10km grid squares during the breeding season (April to August) and perhaps you would like to undertake the same squares you participated in during the previous surveys. New surveyors are very welcome and training will be provided during some nationwide workshops later this month. We would like to invite you to participate in the upcoming survey and hope you will enjoy the fieldwork and the collection of this important data. We hope you will consider volunteering to support this conservation task and hope you will all be able to cover a 10km square (or two) or perhaps put together your own small team and cover a number of squares. Standardised methods will be available at the workshops and by email. We look forward to working with all of you over the coming months. If there is anything you need from us for in relation to the survey please feel free to contact any of us at any time by email or by phone, contact details below. We also invite you to attend any (or all) of the up-coming survey training workshops which will cover hen harrier ecology, methods, reporting and other research opportunities during the course of the survey. These workshops will also allow people to meet other fieldworkers and discuss the methods and survey requirements. Survey material will be available at the workshops, but we will also forward potential survey allocations, recording forms and detailed survey instructions electronically in due course. If you wish to participate in the survey but are unable to attend any of the workshops, please let us know and we will forward all information electronically. Participation on the workshops is free. Whilst numbers are not limited, we ask you to indicate your preferred venue and date and register in order that we may estimate numbers of participants with the hotels for catering purposes. Please browse through the workshop material and then follow the instructions on the booking form to confirm your preferred venue or correspondence details for electronic communication in relation to the surveys. 1) Charleville. Charleville Park Hotel, Main Limerick Road, Co. Cork.Saturday 21st March 2015. 2) Charleville. Charleville Park Hotel, Main Limerick Road, Co. Cork.Monday 23rd March 2015. 3) Athlone. Hodson Bay Hotel Athlone, Co. Westmeath. Saturday 21st March 2015. 4) Gort. Lady Gregory Hotel. Ennis Road, Gort, Co. Galway, Monday 23rd March 2015. 5) Donegal. Mill Park Hotel. The Mullins, Donegal Town, Co. Donegal. Tuesday 24th March. 7) Wicklow. Wicklow Mountains National Park, Kilafin, Laragh, Co. Wicklow. Wednesday 8th April 2015. Participants will be provided with tea/coffee on arrival, lunch is not provided but all hotels can cater for lunch at reasonable rates. Accommodation is not included and participants are responsible for making their own arrangements, if required. Participants will need to bring a notebook and pen to the workshop. Hand-outs (hard copy and electronic data sheets) will be provided. Standardised recording forms, method statements and maps will be available at the workshops, but will also be circulated electronically to all survey participants. Star on the move again! After 3 years apparently well-settled on territory and paired with a female in west Connemara, something is going on with 2009 male Star. Over the winter he made a couple of excursions away from Connemara to south-east Galway but returned to his territory. Not so just now though. After returning to his territory on 6th Jan he headed east on 13th Jan roosting on the shore of Lough Corrib, the to Loughrea in SE Galway on 15th, then the shores of Lough Derg near Portumna on 18th, east into north Tipperary near Lorrha on 20th, north into south Offaly on 21st, to Lough Ennel in Westmeath on 23rd, and on to nearby Lough Owel on 24th Jan where he spent the next few days. On 28th Jan Star headed east into Meath then south to roost near Blessington, Co. Wicklow nest day. On 30th he headed further south to roost near Tullow, Co. Carlow, then south-west into Tipp roosting between Fethard and New Inn next day. On 1st Feb Star started to head back north-west to roost near Feakle in east Clare, then on to the west shore of Lough Corrib next day. On 7th Feb he finally returned back on territory to roost near his 2014 nest site. On 9th Feb he was back on the shore of Lough Corrib where he remains for the moment. Although it’s as yet too early to be definite, all the evidence from his movements away from his territory suggests that something bad has happened to his mate. It’s just too unlikely that he would be spending so long away and travel so extensively round Ireland (see the map showing his GPS satellite tracks) if he had a mate still on territory. Over the next couple of months we should be able to confirm this but if something has happened to his mate (2009 female) it’s unlikely we will ever know for sure what as she doesn’t have a working transmitter to relocate her. Star will be keen to breed again this year so let’s hope he finds his old or a new mate pronto! Star goes AWOL for Christmas! Happy Christmas to you all and keep a look out for eagles and kites on your travels!